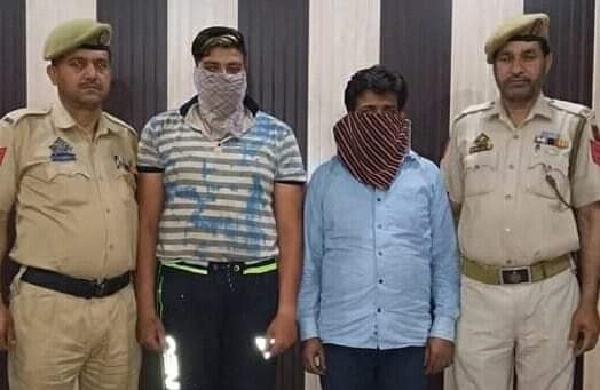 Continuing its crackdown against drug menace under Operation Sanjeevani, District Police Jammu arrested two drug peddlers and recovered heroin on April 14, 2019. A joint team of District Special Branch, Jammu and PS Janipur led by SHO Janipur, Insp Harmohinder Singh, during routine checking, stopped a vehicle with number JK18-9579 for checking. The two persons in the vehicle were identified as Irshad Ahmad Naik, s/o Abdul Salam Naik, r/o Kulgam and Sachin Kumar, s/o Somu kumar, r/o Lower Shiv Nagar, Bakshinagar and on search, 32 gm of heroin like substance was recovered from their possession. In relation to this, FIR no. 52/2019 U/S 8/21/22 NDPS Act has been registered at PS Janipur and investigation has been initiated.